Looking for the perfect gift for Spring, Easter -- or any day? Then what could be more perfect than a hefty box of Dorothy's Candies deluxe assortment. Dorothy's Assortment always pleases -- becuse it contains more of what you crave -- real nut clusters loaded with meaty chunks of fresh-roasted premium nuts -- old-fashined cordialed cherries; luscious caramels and more. 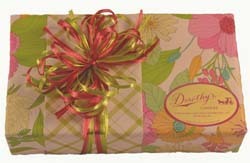 Beautifully gift-wrapped in spring colors -- for any and every occasion. Sold in the two pound size -- one to share and one to savor.